Oh, my sweet baby boy. 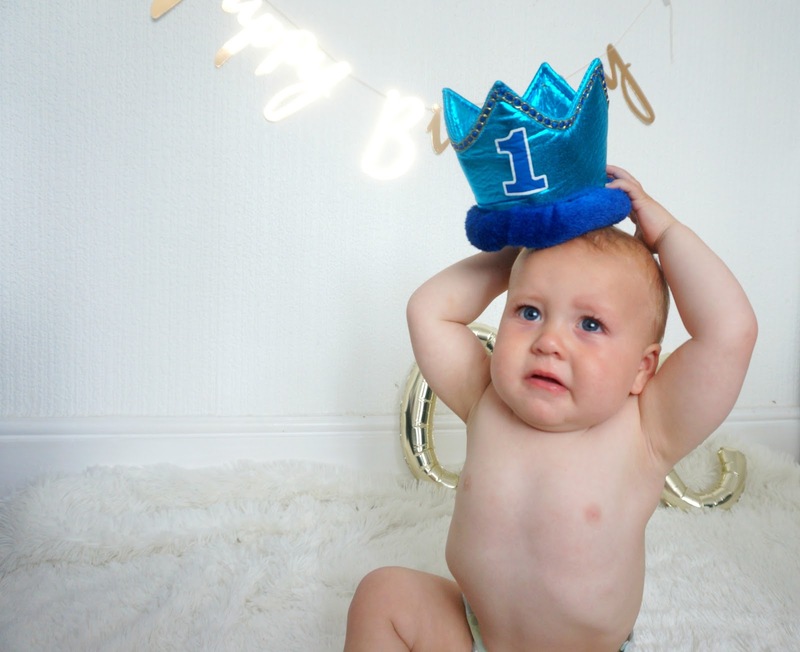 How are you One year old already? The past 12 months sure have flown by, too quickly. You were very unexpected, but an exciting surprise. From the moment I found out I was pregnant, I instantly fell in love with you. 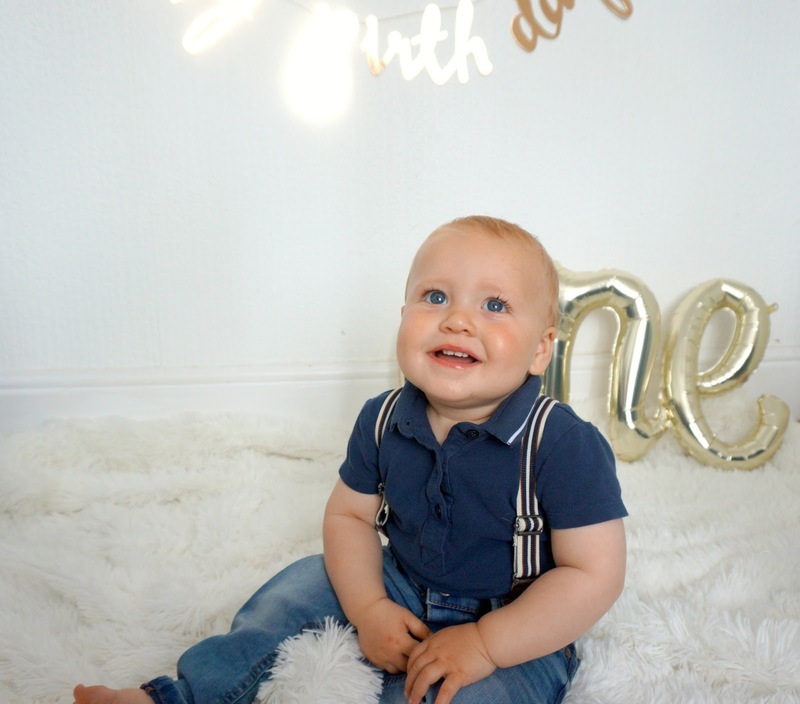 The first few weeks of the pregnancy were a nightmare as I wasn't sure what was going on, but we had our first scan, and your little heart was beating away. I was asked to come back a fortnight later because you were only 10 weeks and they wanted measurements for 12 weeks. Again, you were all healthy and wriggling away in my tummy. I had thought about keeping your gender a surprise, and in a way now, I wish I did. But I think after having two girls, I was curious to see if you'd be the boy I had always wanted. You see, ever since Mammy was a young teenager, I've always wanted a little boy. I had no idea why but now that I have you as my son, I know my reason. Being a Mama to a boy is just amazing. But of course, I love your big sisters just as much. You're all so special to me. When I went to the gender scan at around 14 weeks, with your Daddy, Nain, Taid and your two big sisters, I was so nervous. I was full of mixed emotions. The most exciting parts were seeing you on the big screen wriggling away and watching your big sisters' faces. The lady asked me if I'd like a boy and I said yes. I've never hidden the fact that I wanted a baby boy. Never. When she told me "you're having a baby boy" I wanted to cry. I was so happy and full of excitement. I couldn't wait to go to the boy's section and start picking out new clothes. Most of your clothes said 'Little Brother' on them, super cute! Pregnancy with you was hard. Having to look after your two big sisters, still do everyday routines, coping with Obstetric Cholestasis and everything else. But, having you in my arms on the 16th of July 2016 was the best feeling ever. What made it even more special was I wasn't even expecting you that day. It was my first experience of going into my labour 'myself.' I was booked for an induction on the 19th of July, but you didn't want to wait. It was a painful but amazing experience. You sure wanted to make a show as you didn't even give your Mama a chance to have gas and air properly. When you were placed on my chest, all I could say was "We have a boy! We have a boy!" No words can describe that feeling holding you and seeing your beautiful squished up face for the first time. I had decided to breastfeed you, and I was extremely lucky that you latched on the first time. Again, breastfeeding was a whole new experience for me. I did feel like a first Mama all over again but 12 months down the line and we're still going strong with breastfeeding. You sure are extremely clingy to me and with your Dad too! You two are like best buds, and it's super cute. Each time Dad comes home from work, you stop what you're doing and go crawling straight to the door for him to pick you up and give you a huge cuddle. The smile on your face is priceless. It took me a long time to be ok with you going to other people. But it took you a long time to be separated from me for a long time too. I think it may be because you are my last baby. You were the last baby who grew in my tummy and the last baby who I'll see reach these exciting new milestones. It makes me sad, but I couldn't imagine another baby now. You and your sisters are perfect in different ways. You completed our family. The past 12 months have been amazing, with its ups and downs and lack of sleep. You still quite a pain with your sleeping at night but have improved with your day naps - finally. Now it's to learn how to sleep from 7 pm until the morning, but I guess that will come (I hope). I've been a sleep deprived miserable person for the past 12 months, so I'd be lying if I said I wouldn't change a thing, I would change your sleeping habits! But saying that, I don't regret all the extra cuddles we have had. Those night time feeds cuddling up and those evenings cuddling you to get you back to sleep. I don't regret them. They are moments I will never get back. Never. You have grown to be such a cheeky chap. Your laugh is just the cutest and the funniest. You grew up pretty quickly in your looks because of all your teeth. A lot of people comment on how many teeth you have got, and now you've got another 3 cutting through. I love how you're such a cuddly baby. For the past week, you've been super clingy to Daddy and me and I think it's something to do with the new teeth coming through (hopefully) but I'm not complaining. I must admit, I secretly like you want to come back to me when someone else is carrying you. You're such an amazing little boy. Now, please, stop growing! Or let the next 12 months go by slowly. We love you lots, Freddie George. 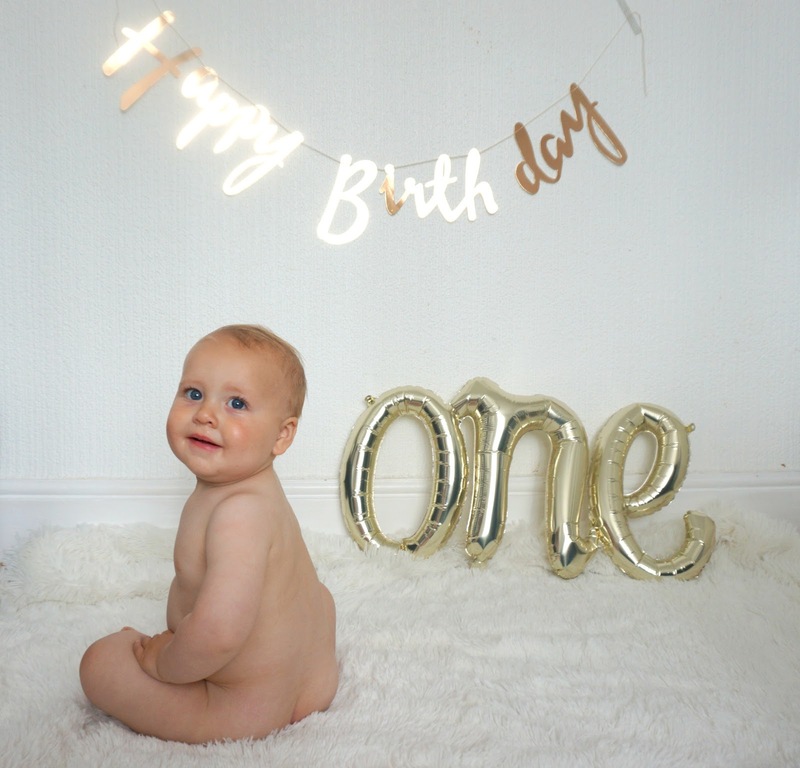 Here are just a few photos from your first birthday photoshoot. Beautiful tribute to your son and so generous of you to share such special family moments too. It is funny how you sense when your family is complete - I was just the same when I got to my third. Also in my experience the last you hangs onto babyhood for a long time and are filled with charisma. Happy Birthday Freddie! You are such a cutie! 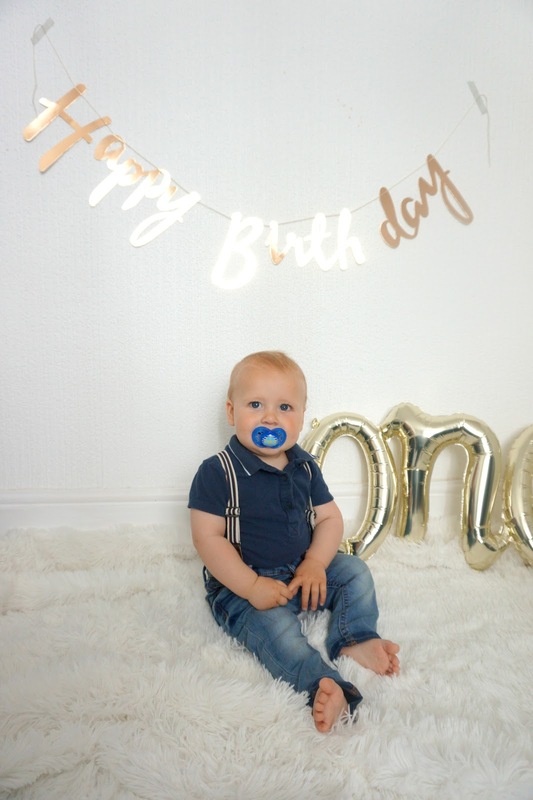 It seems like so long ago since my two turned 1! 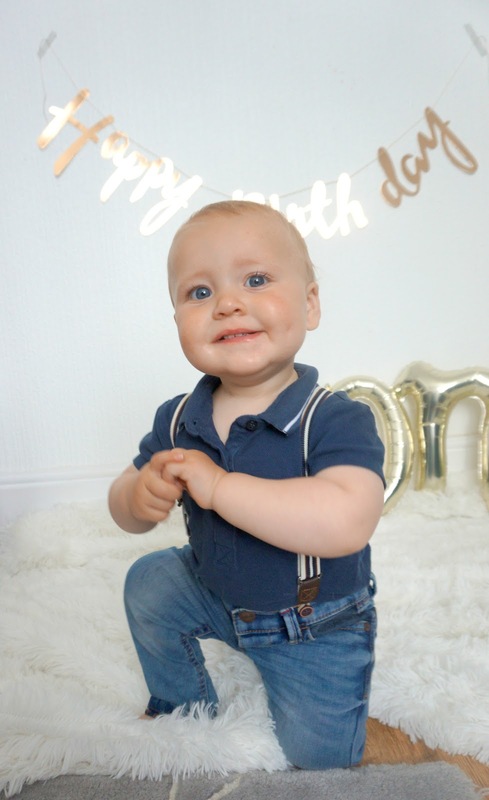 And what a gorgeous little birthday boy! 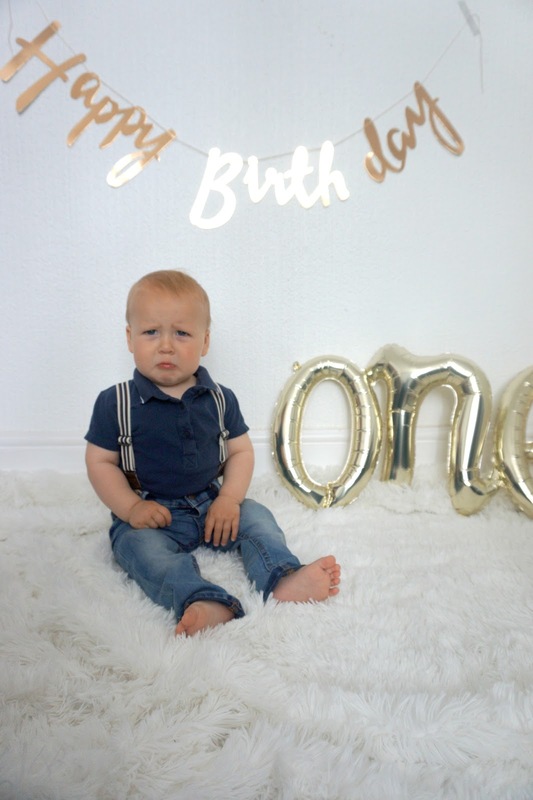 I especially like the grumpy face picture, we have one similar from Rory's first birthday. Looking back I wish we would have kept his gender a surprise. We both wanted a little boy so much I think it would have been extra special to find out of the day. Looks like you've had a fabulous time celebrating. Thanks so much for linking up at #KCACOLS. Hope you come back again next time.